Choluteca, Honduras – Auxiliadora D. Espinal, earns a low income. She wanted to serve a full-time mission for her church, but her lack of resources made it look impossible. One day, she was referred by her religious leader to Lifting Generations. The Lifting Generations manager explained to her that their assistance would complement to her efforts. Lifting Generations assisted Auxiliadora with pre-missionary aid, such as medical exams, luggage and clothing. She served as a full time missionary at the Employment Resource Center (ERC). Following her service in ERC, she had no job and facing a difficult economic situation again. She decided to visit Lifting Generations Foundation again. She met with the Foundation staff and began her business training called “Principles for Establishing New Business” (PENN). 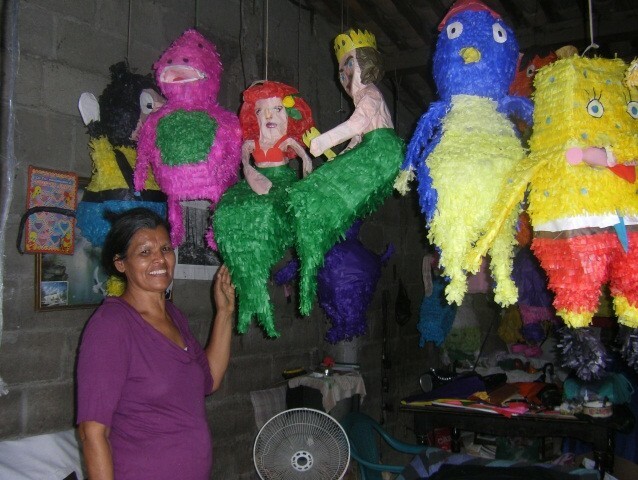 After attending the workshop, she developed many business ideas, and felt motivated to start a business of making piñatas, which gives her the opportunity to have a better life. In addition, she has developed the good habit of saving. For her endurance, courage and perseverance she is part of our focus clients.